1: Powerful Function: 2.4GHz wireless connection via the included USB dongle, plug and play. Mouse Trouped Combo, Portable Multi-media Remote Control for Android TV Box, Pad, Google TV Box, Xbox360, PS3, HTPC/IPTV. 2: Remarkably Compact: Small and handheld design, innovative Shape, easy to use. 3: QWERTY With 92 Keys: wireless keyboard with touchpad supporting multi-touch function, mouse left and right buttons, easy to type and copy/paste. 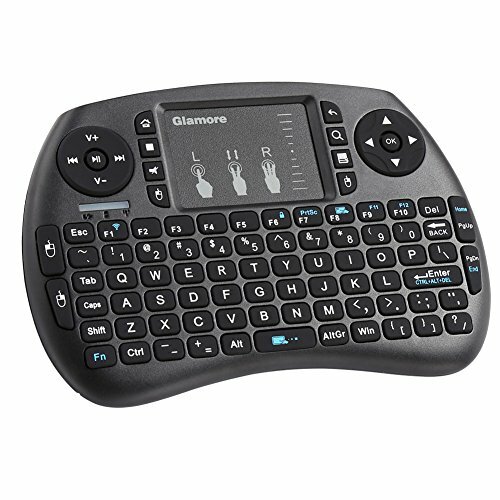 4: Power Source: Wireless mini-keyboard built in rechargeable lithium-ion battery, it\'s very easy to replace. 5: If can\'t work or lost connection, re-sync as below steps: 1. Charge keyboard for two hours and switch on; 2. Hit Fn+F1 simultaneously for three seconds, the light on keyboard would blink; 3. Plug dongle into device USB port, the light would go out soon.